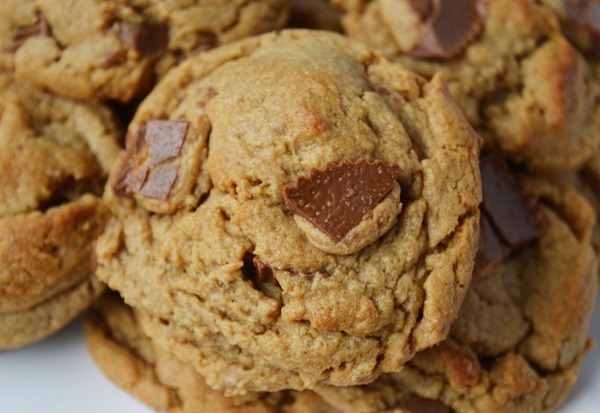 What better to do with leftover Halloween candy then put it into cookies? Okay, maybe adding it to cupcakes or brownies would be great too, but these are quick, easy, and gluten free! It’s my favorite flavor combination of all time. Don’t get me wrong, I love strawberry and chocolate, caramel and chocolate, raspberry and chocolate. So basically anything + chocolate. It may help that it is also my husband’s favorite and a commonly requested flavor combination for birthdays. Back to the cookies. They require 1 bowl, a couple measuring cups and 1 cookie sheet; meaning minimal clean up and not a ton of cookies sitting in a container tempting you to eat them all. However, if you plan on sharing, this recipe doubles well. Beat egg in medium sized mixing bowl. Add all other ingredients to beaten egg and stir well. You may also use a hand mixer. 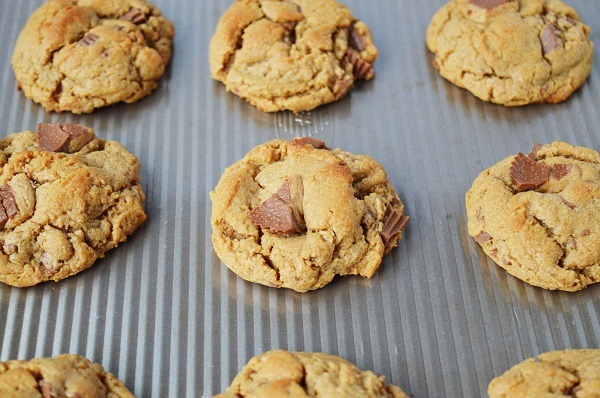 Fold in chopped Reese’s or other mix in. Using 2 tbsp cookie scoop, place dough on cookie sheet. Bake for 8-10 minutes until lightly browned on edges. Allow to cool at room temperature before placing in storage container.